The CANM8 CANNECT K2M is a dual CAN Bus interface that provides an accurate conversion from KMH to MPH. Specifically designed for use with imported vehicles featuring a KMH only speedometer, this interface will convert the speedometer from KMH to MPH using the vehicle’s CAN Bus system. This interface also features a speed pulse output on compatible vehicles. N.B. Speed pulse output is not available for all vehicles. 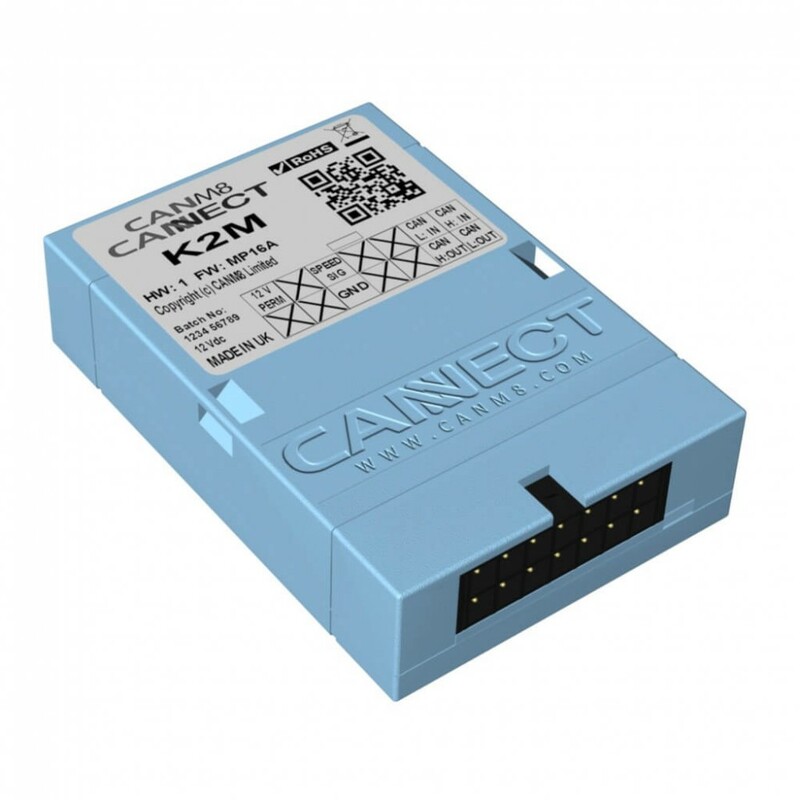 The CANM8 CANNECT K2M requires no modification to the existing speedometer face as, after installation, the needle will be calibrated for MPH. For example, where it says 50 KMH on the existing dial, this will now be 50 MPH when the needle is pointing to 50. It is ideal for vehicles imported into the UK as it will allow the vehicle to be registered in the UK with the DVLA. Please note that the CANM8 CANNECT K2M interface will only convert the speedometer dial from KMH to MPH. The vehicle odometer will remain in KM but will now clock up in miles. The interface features a mini wiring connector, which unplugs to allow easy installation. There are 4 connections to the vehicle CAN Bus wiring along with a connection to a permanent, fused 12v power supply and an earth connection. The interface is connected onto the vehicle CAN Bus wires, usually located at the back of the speedometer, and can be installed by any competent auto electrician. Full vehicle specific installation instructions will be proivided with the unit so please state your vehicle Make, Model & Year in the box at checkout. Flashing Green: CAN Data received and vehicle type recognised. GREEN (Untwisted) > Speed Signal Output : 12v pulsing (1 Hz = 1 MPH approx).